A hard-needed bath yesterday, as soon as I arrived. You have to use it when it's there. And then for a supermarket. I was lucky there was apparently only Kronan and they closed at 17, because it was Saturday. I had found a packet of rye bread, I thought I had left somewhere so I bought schrimp salad and an Icelandic Castello - Kastelli. This is the first time I have eaten a whole schrimp salad - just like that. It rained tonight and it's wet, moist and cloudy this morning so I don't hurry. The connection is good here, so I've just seen Usain Bolt being beaten on the 100 meter. Now, at 9 o'clock, the weather looks better. 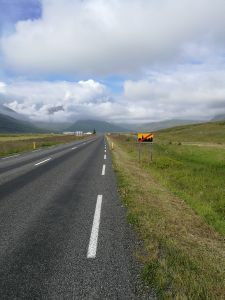 The programme is 32 km up above a pass of 350 m. An climb of 6-10%, then I should be back in Egilsstaðir. At the last minute I come to talk to an Icelandic citizen. He is of the age group who may speak a little Danish. 77 years. Has been in Roskilde and seen the king's graves, and when he was a child, Chr. X was his king. It fits with what the coffee lady said. The old people feel a strong bond to Denmark. After 15.42 km I am up. Here I am sweating in my t-shirt and the wind is ice cold. As they promised, there should be 9 gr. 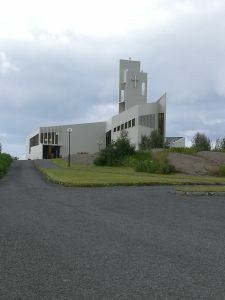 in Fagridalur, as the transition is called. It's time to put 2 layers extra on. The downhill runs smoothly. I do not dare to drive too fast with a cracked rim and only one brake, so I keep it for less than 40 km/h. I am freewheeling the next 16 km, except for 2 smaller parts. It is with a sense of both relief and satisfaction, I enter the reception. I DID IT! In spite of everything. Must have a cappucino immediately and here is a refill. At 13.40 the laundry is in the machine and the sun is shining - still. It won't take long, but the sleeping bag can now be aired. Here the temperature should currently be 15 gr. unlike Reyðarfjörður, where I come from: 10 gr. !! So, do you want to go to Iceland, go to Egilsstadir - and stay there. Now, for example, the sun has come back - good for the laundry - but over the highlands, where the sun shone earlier, it looks dark and rainy. I ask the girl at the reception - here they are Icelandic - what they call the light rain, with normal drops that just fall very scattered. The rain that has followed me all over the country. She thinks it must be "skurir", but they have a lot of words for rain and especially snow - like in Greenland. I get some more knowledge on the school system. I speak with a lecturer at the University of Iceland, which is under the state. There it costs 75,000 kr. (5,000 d.kr.) a year to go, but at private institutions such as the University of Reykjavik we are up to 250,000 kr. (16,000 d.kr.) a year. As for the "Mentaskola" there is a subsidy for the room, depending on how far away you live. 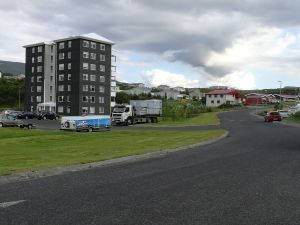 The large aluminum plant, which should be situated eastwards, is located in Reyðarfjörður, wher I just came from, just a little further out of the fjord. 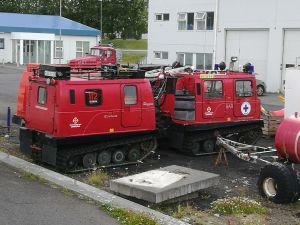 It is powered by the power plant at the large dam Karahnjukar in the highlands, which is feeded by melt water from Vatnajökull. The dam was partially built for that purpose. Revenue from the aluminium production - which also takes place in SV, and which foreign companies account for - should now exceed the revenues from the fishing industry! 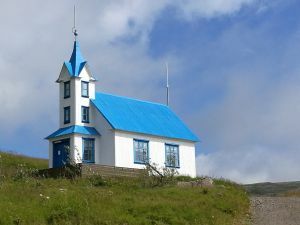 Go out to see how they live in Egilsstaðir and ends up at a school where something is going on. Inside, there is a competition in cake decoration right now. 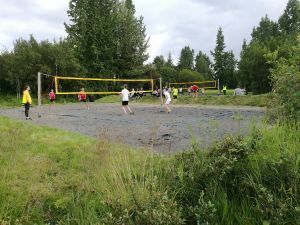 Outside there is volleyball for 2-man teams. In this weekend there's a tradition in the area with a lot of competitions for the youth. The host changes, this year it is Egilsstadir. It is the sports and youth clubs that stand for it. I eat in the common room (the front desk) as there is a microwave and I use the possibility to get something different from the usual. When I get out, it's "skurir". A quarter later it is stopped - more or less. A cyclist came to talk to me earlier. An Argentine, who, however, resided in Switzerland. Afterwards, I gave him my Icelandic Muesli. It was too damn tasteless. Well, I showed him the bag, and then he said it was the one he used to buy. Then I might as well give it to him. Tomorrow I will stay. 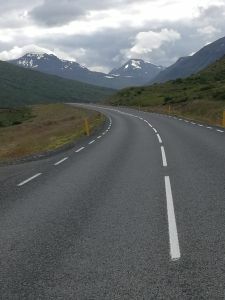 Only need to cross the mountain to Seyðisfjörður, and the ferry will not sail until Thursday.